Some canine anatomical names may be familiar to you — dogs have elbows and ears and eyes — but other names may be downright foreign. 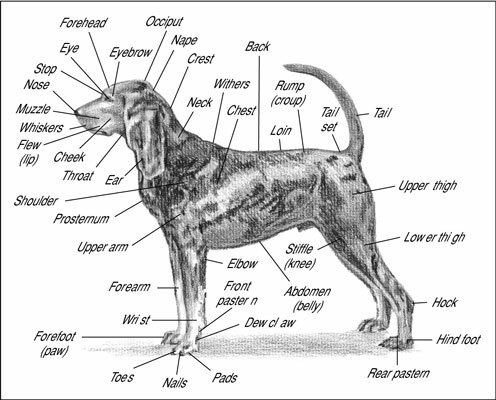 Many anatomical terms used to describe parts of a dog are similar to the ones used for horses. Nose: Dog noses are often cold and wet, and of course, they usually get stuck where they’re not wanted. The muzzle (foreface) comprised of the upper and lower jaws. The stop is an indentation (sometimes nonexistent) between the muzzle and the braincase or forehead. The forehead (braincase) is the portion of the head that’s similar to your own forehead; it goes from the stop and eyebrows to the back point of the skull. The occiput is the highest point of the skull at the back of the head and a prominent feature on some dogs. Pricked: Pricked ears are upright. Dropped: Dropped ears hang down. Button: Button ears have a fold in them. Cropped: Cropped ears are surgically altered. Eyes are pretty obvious, and most often obviously brown. Like humans, dogs have eyebrows, or simply brows. Whiskers provide some sensory feeling. Flews is just a fancy word for a dog’s lips. A dog’s cheek is the skin along the sides of the muzzle — about where your cheeks are if you had a muzzle. The nape of the neck is where the neck joins the base of the skull in the back of the head. The throat is beneath the jaws. The crest starts at the nape and ends at the withers (see the last item in this list). The neck is pretty self-explanatory; it runs from the head to the shoulders. The shoulder is the top section of the foreleg from the withers to the elbow. The withers are the top point of the shoulders, making them the highest point along the dog’s back. The prosternum is the top of the sternum, a bone that ties the rib cage together. The chest is the entire rib cage of the dog. The back runs from the point of the shoulders to the end of the rib cage. The term back is sometimes used to describe the back and the loin. The flank refers to the side of the dog between the end of the chest and the rear leg. The belly or abdomen is the underside of the dog from the end of its rib cage to its tail. The loin is the back between the end of the rib cage and the beginning of the pelvic bone. The upper arm on the foreleg is right below the shoulder and is comprised of the humerus bone, which is similar (in name anyway) to the one found in your own upper arm. It ends at the elbow. The elbow is the first joint in the dog’s leg located just below the chest on the back of the foreleg. The long bone that runs after the elbow on the foreleg is the forearm. Like your arms, it’s comprised of the ulna and radius. The forearm may have feathering on the back. The wrist is the lower joint below the elbow on the foreleg. Sometimes called the carpals, pasterns are equivalent to the bones in your hands and feet —not counting fingers and toes — and dogs have them in both forelegs and hind legs. Dogs have a foot or paw at the end of each leg, called the forefoot or hind foot depending on whether it’s front or back. The paw comes with nails (sometimes called claws), paw pads, and usually dewclaws. A dog’s toes are equivalent to your fingers and toes, although you can wiggle yours more easily. Dewclaws are vestiges of thumbs. Because dogs never figured out the opposable thumbs concept (thank goodness, too— can you imagine what mischief they’d get into with them? ), these dewclaws are more or less useless appendages. The toenails or claws on the end of each toe are actually incorporated with part of the last bone of the toes. On the underside of the foot are several pads, including one main pad (communal pad) and a pad under each toe, for a total of five pads. You can find stopper pads behind the wrist on your dog’s forelegs as well. The upper thigh is the part of the dog’s leg situated above the knee on the hind leg. The stifle or knee is the joint that sits on the front of the hind leg in line with the abdomen. The lower thigh is the part of the hind leg beneath the knee to the hock (see next bullet item). Some dogs have feathering along the back of their lower thighs and hocks. The hock is the oddly shaped joint that makes a sharp angle at the back of the dog’s legs. It corresponds with your ankle. The rump (or croup) is the proverbial rear end; it’s where the pelvis bone is. The tail set is where the tail attaches to the rump. Some dogs have high tail sets, others have low ones. Everyone recognizes the dog’s tail (or its absence); it’s usually wagging at you.